The RF-V4 is as easy to use as plugging in a network cable. 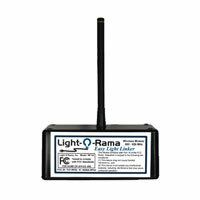 Wirelessly connect your PC to outdoor controllers for convenience and safety. Each controller can have its own RF-V4 or groups of controllers can share a single RV-V4. By breaking you show into wired sections that contain a RF-V4 you greatly simplify the data cabling. The RF-V4 is certified for use in the United States and Canada. This price includes two Wireless Units and two 10' Cat5 patch cables. Note: To send wireless signal from your computer USB485B Adapter with Signal Booster is required.